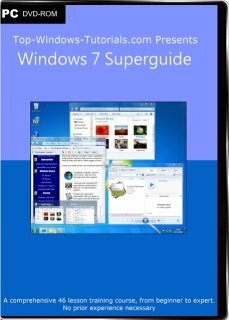 Get the most out of your new computer or operating system upgrade investment with the Windows 7 Superguide. Don't spend money on traditional books when you can have an e-book and video course, the next best thing to your own private computer tutor! Are you ready for Windows 7? Microsoft's newest operating system is taking the computing world by storm with its great new features and improved system performance. Now, thanks to our latest Superguide, learning Windows 7 just got a whole lot easier. Whether you are new to computers or just new to Windows 7, this Superguide will help you to get the most out of the new operating system. The guide contains an amazing 46 lessons and 43 video tutorials (each provided in three different resolutions to suit a wide range of monitors) as well as a printable 270 page e-book containing lessons and worksheets. The Windows 7 Superguide is endorsed by The Federation of SeniorNet Societies New Zealand for use in its 90 learning centres across New Zealand. We are proud to support SeniorNet New Zealand with our best selling Windows 7 Superguide DVD and delighted to show their endorsement of it. Get the most out of your new computer or operating system upgrade investment with the Windows 7 Superguide. Don't spend money on traditional books when you can have an e-book and video course, the next best thing to your own private computer tutor! There really is no better Windows 7 beginners course available anywhere on the internet.